The tiger or “tigger” melon is a striped, baseball-sized fruit whose juicy flesh is similar to that of the cantaloupe and honeydew. Tiger melon is prepared and eaten much like other melons. But because its flavor is often only mildly sweet, sugar is added to enhance the taste, or the melon is combined with other fruits or used as an ingredient in prepared dishes. Grown mainly in backyards and available occasionally at farmers markets, the best tiger melons are vine-ripened, colorful, fragrant and smooth. Wash ripened melons thoroughly with cool water and towel them dry. Cut them in half and scoop out the seeds with a spoon. Sprinkle the cleaned melon half with sugar and fill it with other cut fruit, cottage cheese, yogurt, ice cream or gelatin dessert, and use it as an edible bowl. Do not eat the skin. 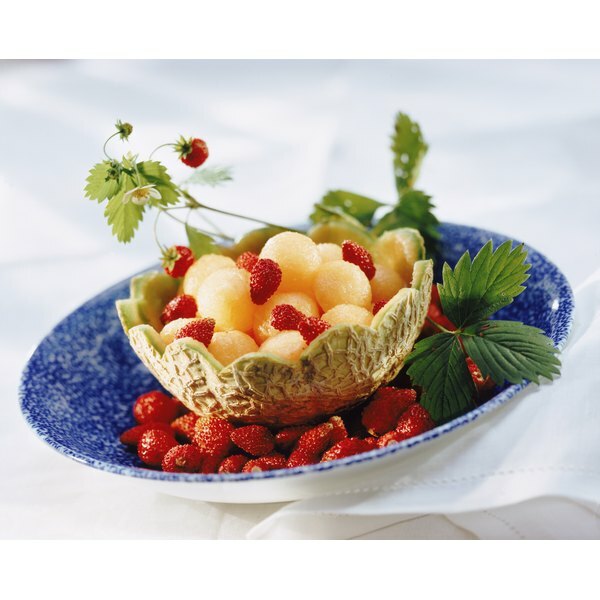 Slice, cube or scoop out the melon flesh with a melon baller and toss it in a bowl with other cut fruits for a refreshing salad. For a stronger flavor, sprinkle the fruit salad with sugar, drizzle it with cognac, and cover and refrigerate it overnight. Toss it again to mix the juices before serving. Serve tiger melon cut into wedges, drizzled lightly with syrup or sprinkled with sugar, and topped or wrapped with a slice of prosciutto ham. Complement the dish with a cup of tea or glass of dry muscat. Make tiger-melon jam. Combine chopped melon and pectin in a pan, simmer until the mixture is thickened and sweeten it to taste. Pour the hot mixture into canning jars and allow it to cool before using the jam. Seeds can be saved for planting. Rinse the scooped-out seeds in a colander with cool water, removing all pulp. After allowing them to air dry, bag and store the seeds in a cool, dry place until the following spring. Tiger melons can be refrigerated for up to two weeks, depending on your appliance. Ripened melons require no protection. Store cut melons or melon pieces in glass or plastic containers, sealed bags or plastic wrap. Ripen uncut melons at room temperature. When making jams, jellies and preserves, follow the instructions on the canning jar and pectin-package labels. Refrigerate all jams after opening.